An infrared heat lamp uses a special form of incandescent light bulb primarily to produce heat rather than to generate light. These lamps do produce some light, but most of the energy they produce is directed towards heating the room. The incandescent bulb or bulbs in the lamp produce heat by generating infrared light. Normal light bulbs are designed to produce light and the heat they generate is considered to be waste. Conversely, the light bulbs that are used in heat lamps are intended primarily to produce heat, with the light being essentially a waste product. Infrared heat lamps are relatively energy efficient so they do not use up too much power. However, they are designed to be used to provide some extra heat in your bathroom when it is needed, rather than to be left on for a long time. It is best to avoid using these lamps as the only source of heating in your bathroom, or to rely on them as a source of light, as well as for heating. Ideally, the infrared heat lamp should be installed with a switch that can be used to control it separately from the lighting in the room, and turned on as needed. Having plenty of heat in your bathroom can make using your shower or bath a lot more comfortable. Tiled floors, which are common in bathrooms, can be very cold, particularly during the winter, and stepping out of a hot shower or bath onto cold floor can be incredibly uncomfortable. Keeping your bathroom well heated can also help prevent problems with moisture. A heat lamp works best when it is used to provide some extra heat when it is necessary during cold weather, rather than as the main source of heat in the room. If you leave a powerful heat lamp on for long enough it will be able to heat up your bathroom, but there are far more effective bathroom heaters that you can use as the main source of heating in a much more energy efficient way. A heat lamp can provide an instant burst of heat that is ideal during particularly cold weather. Most of the heat will be directed into the area next to the heat lamp, so it is important to position it carefully. The heat lamp will usually be mounted on the ceiling, so it should be placed where it will point down onto the place where you will be standing as you dry yourself off, or where you will step out of your bath or shower. The lamp will be more effective if you have a smaller bathroom and if the ceiling is lower. Modern heat lamps are far more attractive and compact than the unsightly large lamps of the past. Today, manufacturers create light bulbs that are similar to normal bulbs, but which can also produce infrared radiation to heat the room. These newer heating bulbs provide instant warmth as soon as they are switched on. They are ideal for use in the bathroom environment, since they can cope with moisture and splashing. They can also last a long time, although they may be more expensive. Some heat lamps are designed to provide both heat and light from the same fixture, since they include different types of bulbs for different purposes. These combined lamps can be a neater and more convenient option, particularly if you have a fairly small bathroom. If you are considering such a lamp, make sure that it offers the option of switching each component on and off separately, so that you do not have to turn the heater on in order to light your bathroom. Having adequate ventilation in your bathroom is essential, particularly when you are using a heater in the room. Ventilation can help to prevent steam or any fumes from building up and it can help to prevent any problems with dampness in your bathroom. Many heat lamps are designed to provide some ventilation. They come with a fan built into the lamp. In addition to assisting with ventilation, pairing a fan with the heat lamp can help to spread the heat around through the room. This can enable the lamp to heat the whole room, rather than creating a single hot spot. Some heat lamps come with a selection of extra features, such as a range of different controls. One useful extra feature that you may want to look for is automatic thermal cutout. This can shut off the heat lamp if it becomes too hot, in order to prevent overheating and the potential damage that it could cause. The power provided by a heat lamp is one of the most important considerations. A more powerful lamp will be able to produce more heat and to do so more quickly. If you have a small bathroom, then you will not need such a powerful heat lamp. Larger heat lamps will often be more powerful than smaller ones, particularly if they use multiple bulbs. Most lamps come with one, two or four bulbs. A single bulb lamp may be adequate for a small bathroom, but a lamp with four bulbs may be necessary in a larger room, or if you require more or faster heating. The number of bulbs is not the only important factor, since different types of bulbs produce different amounts of power. You should also consider the watts produced by the bulbs, as well as the number that is present in the lamp. Some heat lamps can be a lot louder than others. It is worthwhile considering how loud a heat lamp is before you choose which one you want to buy. Relaxing in your bath can be much more difficult when a loud lamp is disturbing your peace, so if you enjoy long, hot baths it can be a good idea to choose a quieter lamp, even if you have to pay more. You will want to choose a heat lamp that looks good in your bathroom. There is a wide range of different styles and sizes of lamps to choose from, so you can find one that best matches the rest of your bathroom decor. Any electrical device that will be used in the bathroom needs to cope with the steam, moisture and water. It is also important that the devices are installed properly and safely, since mixing water and electricity can be dangerous. Bathroom heat lamps can generally be expected to last about five years, although higher quality heat lamps will last longer than lower quality ones. Ensuring that your heat lamp is properly installed is essential if you want it to work well and be safe to use. Working with electricity always poses a risk, but it can be particularly dangerous if you are using it in the bathroom, since there is likely to be a lot of water and moisture around. It is possible to install a heat lamp by yourself, but it is generally best to leave the job to a qualified and experienced professional. Heat lamps are usually installed on the ceiling in a similar way to normal light fittings. They need to be installed in the right type of fixture. You cannot simply stick a heat lamp bulb in a regular light fixture, because it will not be able to produce the amount of heat that you need. You should choose the position where your heat lamp will be installed carefully. The lamp should not be positioned too close to any objects, such as towel rails or shower rails, as these could become overheated. You should also place the heat lamp where it will provide the most benefit. The prices for heat lamps can vary a great deal. The cheapest ones, with just a single bulb, can be bought for under 10 dollars. 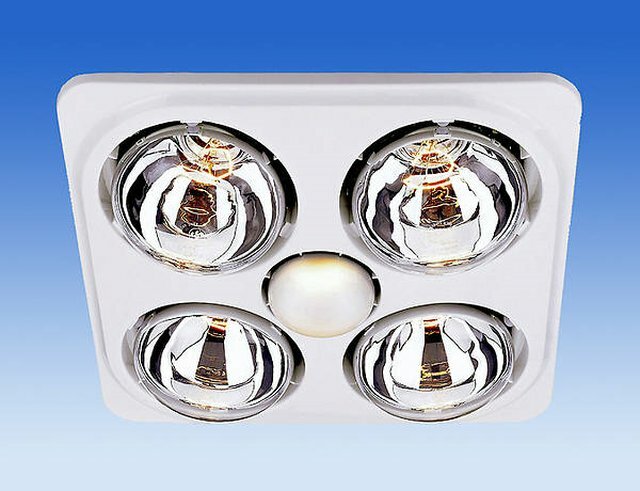 More expensive light fixtures that use multiple bulbs for heating and also offer a range of other features such as fans, can cost hundreds of dollars. Overall, the cost of heat lamps has decreased over time. I am trying to find heating lamb for bathroom , but i think its not available in my country – Jordan – so how can you help me if i would like to order one online . Also i need help to know which on will be the best in my bathroom and to know about the electricity and watt if will be ok in Jordan . Please i am waiting your answer as soon as possible .